KAI successfully conducted the maiden flight of the KT-100 trainer in October 2015. Image courtesy of Korea Aerospace Industries, LTD.
KC-100 Naraon light aircraft served as a basis for the KT-100 trainer. Image courtesy of KAI. The cockpit of the KT-100 is equipped with Avidyne dual integrated flight displays. Image courtesy of Avidyne Corporation. KT-100 is a new trainer jet being developed by Korea Aerospace Industries (KAI) for meeting ab initio training needs of the Republic of Korea Air Force (ROKAF). It is a basic trainer variant of the KC-100 Naraon light aircraft. The new trainer will replace the ageing fleet of Ilyushin T-103 aircraft in service with the ROKAF. The KT-100 is also expected to be offered as a package to foreign customers. The KT-100 trainer successfully made first flight at KAI’s plant in Sacheon Airport, in October 2015. The overall flight characteristics and performance of mounted equipment were tested during the flight. 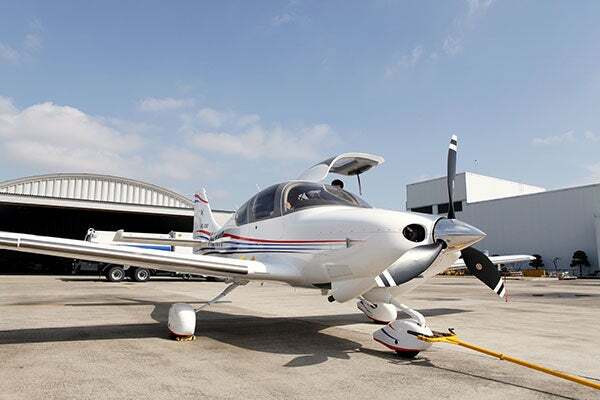 KAI signed a memorandum of understanding (MoU) with the defence and transportation ministries and the Defence Acquisition Program Administration (DAPA) for the delivery of KT-100 basic trainer aircraft to the ROK Air Force Academy, in May 2014. The contract was finalised in December 2014. The ROK Air Force Academy is expected to acquire more than 20 KT-100s, along with flight simulators and associated equipment by the end of 2016. The induction of KT-100 will complement the KT-1, T-50 and TA-50 trainer fleet, and will allow the ROKAF to conduct basic, advanced and combat readiness training with the indigenously built trainer aircraft. The KT-100 aircraft incorporates a composite airframe structure, which offers extended fatigue life and reduced maintenance costs. The low-wing aerodynamic design integrates laminar flow airfoil and winglets, as well as conventional tail. The environment control system on KT-100 includes a vapour cycle cooling system and a bleed air heating system. The aircraft is also installed with a fluid weeping system, as well as air-conditioning and oxygen systems. The KT-100 has a length of 8m, a wing span of 11.2m and a height of 2.7m. It has a maximum take-off weight of 1.63t and can accommodate a maximum payload of approximately 500kg, whereas the empty weight is 1,080kg. The trainer jet can fly at a maximum cruise speed of 210k and can reach a maximum range of 1,000nmi (1,852km). The modern cockpit integrates all electrical flight instrument systems and conventional mechanical flight controls. The avionics suite consists of high-resolution Avidyne dual integrated flight displays (IFDs), dual air data and attitude heading reference systems. "The KT-100 trainer successfully made first flight at KAI’s plant in Sacheon Airport, in October 2015." The aircraft is also fitted with GPS receivers, fully-digital VHF navigation and communication radios, a video / voice recorder, and identification friend-or-foe (IFF) equipment. The power-plant of KT-100 trainer integrates a single TSIOF-550-K engine supplied by Continental Motors. The engine, fitted with full-authority digital engine controls, generates a power of 315hp at 2,500rpm. Fuel is supplied by an integrated system that includes a 90gal main wing tank and a collector tank, with a storage capacity of eight gallons. The electrical power system has two 28V DC alternators and two 24/24V batteries. The conventional tricycle landing gear of the KT-100 comprises a nose landing gear and two main landing gear units. The nose landing gear is set up on the engine mount struts and the main landing gear units are installed on the inboard rib of the wings. The conventional tricycle nose wheel gear enhances the pilot’s visibility and load distribution, and offers directional control during taxing. Virtual Reality Media is a private company that specialises in the design, development and production of state-of-the-art simulators as well as training systems.